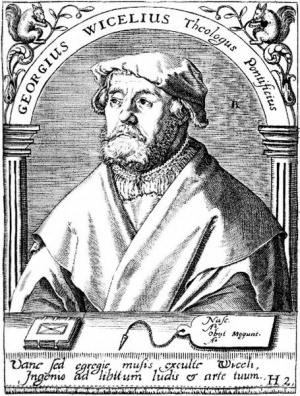 Georg Witzel was a Lutheran clergyman, formerly pastor in Wenigenlupnitz near Eisenach, Thuringia, and also 1525-1531 in Memegk near Bitterfeld. He was a friend of the Anabaptist leader Melchior Rinck, and at the time of the latter's imprisonment in Vacha was living in the same town. In early 1532 he wrote a letter to Rinck seeking to persuade him to renounce Anabaptism and return to the church. A letter of 24 December 1531, by Witzel to M.B.F. reports the alarming growth of Anabaptism in western Thuringia. (To be found in Wicelii Epistolarum libri quatuor, Leipzig, 1537.) Witzel was mild in his attitude toward the Anabaptists. In 1533 he returned to the Roman Catholic Church. Bender, Harold S. "Witzel, Georg (1501-1573)." Global Anabaptist Mennonite Encyclopedia Online. 1959. Web. 25 Apr 2019. http://gameo.org/index.php?title=Witzel,_Georg_(1501-1573)&oldid=141004. Bender, Harold S. (1959). Witzel, Georg (1501-1573). Global Anabaptist Mennonite Encyclopedia Online. Retrieved 25 April 2019, from http://gameo.org/index.php?title=Witzel,_Georg_(1501-1573)&oldid=141004. Adapted by permission of Herald Press, Harrisonburg, Virginia, from Mennonite Encyclopedia, Vol. 4, p. 1137. All rights reserved. This page was last modified on 17 November 2016, at 16:39.